For thousands of years, Olympia oysters provided sustenance for Washington’s tribes and habitat for a host of marine organisms in the Pacific Northwest. Captain George Vancouver’s naturalist Archibald Menzies described them as “plentifully strewn” across intertidal reaches of Washington’s Discovery Bay when the expedition’s ship reached land in 1792. During Vancouver’s day, native oyster populations in Willapa Bay and south Puget Sound numbered in the billions. Like so many natural resources in this fertile part of the world, Olympia oyster stocks were thought to be inexhaustible. However, history has proved this notion to be wrong. Pollution, over-harvesting and habitat loss have collectively taken their toll on populations in Puget Sound. Though greatly reduced in density, the West Coast’s only native oyster can still be found in many intertidal areas. With help from the public and private sectors, government and Northwest tribes, Olympia oysters can reestablish themselvesat sites throughout coastal Washington. Private tideland owners are a critical piece of the reestablishment puzzle. With a full 75 percent of tidelands in Washington State owned privately, much of the best remaining habitat for Olympia oysters — and the persistent populations of oysters themselves — lies undiscovered across Puget Sound and Hood Canal. 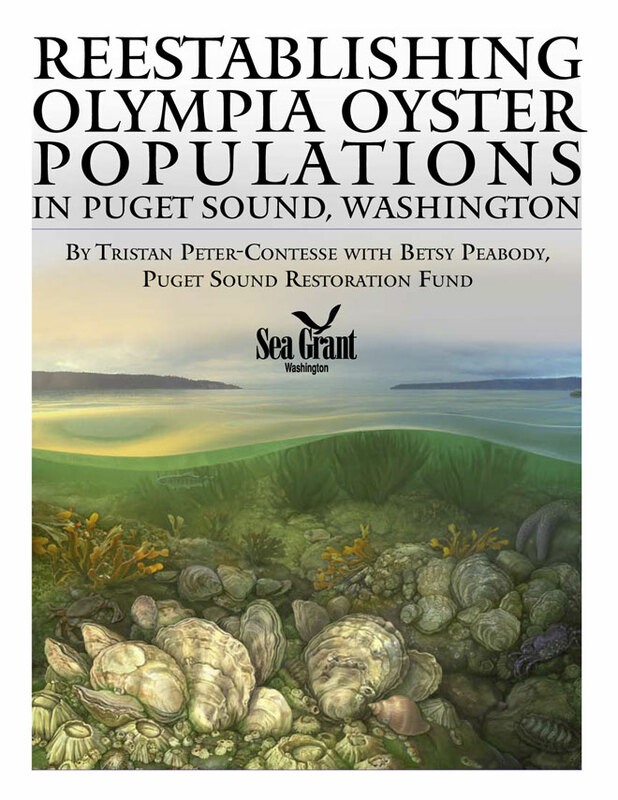 By working with the Puget Sound Restoration Fund and other organizations, tideland owners can identify those prime habitats and assist in the efforts to rebuild populations of the state’s signature shellfish. -- Summary description adapted from the report. Peter-Contesse, T., & Peabody, B. (2005). Reestablishing Olympia oyster populations in Puget Sound, Washington. Washington Sea Grant Program, Seattle, Washington. Peter-Contesse, T., & Peabody, B.